Newlyweds Molly and David are only sixteen and eighteen years old when they pack up their wagon and head west across the plains in search of a new homestead. At first their new life is full of promise: The wheat is high, the dugout is warm and cozy, and a new baby is born to share in their happiness. Then disaster strikes, and David must go east for the winter to find work. Molly is left alone with the baby — with nothing but her own courage to face the dangers of the harsh prairie winter. You have to feel sorry for Rose Wilder Lane: at one point, SHE was the famous author in the family. In her lifetime, she wrote over 20 books, and countless magazine and newspaper articles. She wrote biographies of Henry Ford, Herbert Hoover, and Charlie Chaplin. She is considered one of the founders of the Libertarian movement. My daughter and I have been reading a series of books written about Rose, in the style of the Little House books, by her “adopted grandson” and heir, Roger Lea MacBride (although he died after a few books were written, and his own daughter finished them, from what I understand.) And of course, there is “A Wilder Rose”, the new novel about the relationship between Laura and Rose. This is the first of her books that I have read. You’ll notice in the Amazon synopsis that the main characters are named Molly and David. I’m not sure when this was changed (probably when the title was – and it suddenly became a children’s book, which I find very odd…) but originally the characters were named Charles and Caroline. Sound familiar? 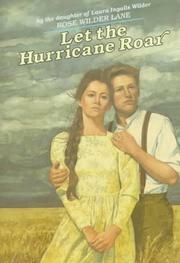 Let the Hurricane Roar was originally published as a magazine serial, and then as a novel, and borrowed heavily from the stories that she had grown up hearing from the Ingalls side of her family. There is a grasshopper plague, and blinding blizzards, and cattle frozen to the ground by their own breath. Anyone who has read the Little House books will be very aware of the similarities. It’s been said that her mother gave her permission to use the stories, but I’m not certain if that’s known for sure; although I suppose at the time she didn’t ever expect to continue the Little House books (Little House in the Big Woods was also published in 1932) to the point where the similarities would be noticed. But taking aside comparisons to her mother’s books (in which, it has been alleged, Rose had more than an editorial hand – but don’t get me started on that one), the story is interesting, but perhaps because it is such a short book (only around 150 pages in the version that I read) I never felt much of a connection to the characters. When a tragedy struck, as a reader I should have felt for them, or wondered what they would possibly do, but I just never did. I didn’t dislike the book at all, but I just never was able to love it, either. I think if it had taken more time for character development it would be more compelling. Honestly, after reading this, I have a very hard time believing that Rose wrote her mother’s books.